Up on deck today is one of my longest tested (and honestly most expensive) optical solutions for your favorite tactical modern sporting rigs. The Trijicon ACOG, specifically the TA31 ECOS model. First stop is a little history from the maker (248Shooter readers take note, Trijicon is HQ’d in our beloved Michigan, Wixom). Trijicon was started in 1981 with exactly the same mission of its modern evolution today, making tritium illuminated optical gun sights. The products they produce have undergone several transformations, refinements, and line expansions and so has the company. Glyn Bindon, the founder, is the namesake for the Bindon Aiming Concept or BAC built into Trijicon’s optical line. This both eyes open shooting technique utilizes the natural capabilities of human eyes to aid rapid target acquisition and engagement while maintaining the increased capabilities of a magnified optic. 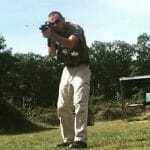 Both eyes open shooting is nothing new and with an unmagnified sight (like a red dot) it is rather simple. Magnifying the optic complicates things because it adds additional distortion to the information your brain is processing from your eyes, one eye having a magnified view and the other an unaided view. Bindon developed this technique by studying how the human eye works with movement, both through magnification and unaided, and then combining that with the illumination properties of his optics. What he developed was a “brain hack” as some call it today, a cheat using our natural body mechanics. Our eyes default while moving, to favor our unaided vision if there is a difference between the two eyes. At the same time, our eyes collect light, and a bright, illuminated object centered in front of the aided eye that moves at the same rate as the unaided eye. Since the reticle is in the foreground, not background like the landscape the image will project through our brains into the vision of our unaided eye because that image is simpler to process. This is an information filtration “hack” that works extremely well. Though the illuminated image projection is now in the opposite eye, the point of aim for the optic and the firearm is the same, or close enough for quick shots. Additionally when the movement stops, and you settle on a target your vision will favor the aided eye again very quickly, in essence you “auto zoom” out to the magnification again. Science! The ACOG (Advanced Combat Optical Gunsight) hit the market in 1992 and began to see military and law enforcement use from 1993 with its adoption by Germany’s GSG9 and then in 1995 with USSOCOM. In 2004, the TA31 model of the ACOG became the first official service rifle optic of the United States Marine Corps with two models TA31RCOA4 and TA31RCOM4. RCO standing for Rifle Combat Optic and the A4 and M4 designations denote the rifle it is to sit on, the M16A4 and M4 respectively. Both these optics were specifically tuned to USMC specs. A 36/ 300 meter zeroing distance and specifically reticle etched for the M855 ammunition in 20” or 14.5” barrels using a 1:7 rifle twist and chrome lining. This configuration maximized potential accuracy out of both rifles. By 2005, 100,000 4×32 ACOGs were out the door. In 2007, the US Army followed the Marines and acquired their version of the ACOG, TA31M150. 2007 also sees the introduction of the ECOS model with a military designation of SU-237 and in 2009 the number of 4×32 sights had grown to 500,000. 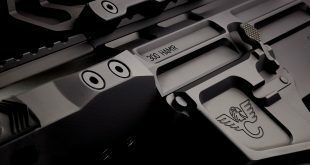 In the last few years Trijicon has ventured an expansion into optics that do not utilize tritium, instead relying on LED technology. Also developing very robust variable power optics like their VCOG line (which I also really want to review) these optics challenge the former standards that precise variable optic options were fairly fragile. My history with the TA31 ACOG started in 2008 when I topped an M16A4 with one for the first time. I was among the last of the Marines trained on the venerable M16A2 rifle and thus learned on classic iron sights (a skill I wish was still taught today). The ACOGs and A4 rifles were priorities for deploying units, not recruits. Even my first M16A4 still wore iron sights (the modular detachable variety). But now eight years and several models of ACOG under my eye, with as many rounds down range as I can muster, let’s get to the ECOS. The TA31ECOS (Enhanced Combat Optical Sight) is one of Trijicon’s line of combination optics. It utilizes 3 aiming solutions to give the shooter as many options as possible for the current shot based on speed, distance, and even damage to one of the other aiming solutions. The ECOS is centered on the TA31, the standard 4×32 ACOG with 32mm objective lens and fiber optic/tritium lamp illumination. Unlike the RCO’s that utilize a chevron aiming point, the ECOS uses a more conventional crosshair. The adjustments are ¼ MOA at 100 meters/yards little difference inside 300 meters, and the turrets are moveable by hand (different from the RCOs which are 1 click to move 1” at 300 meters and use a screw driver or brass case rim to make adjustments). The turrets have protective screw caps that are retained to the optic by a wire and thus are difficult to lose or forget. Grunt proofing as much as possible. The base and mounting solution is a TA75 mount, using A.R.M.S. throw levers for quick detachment instead of the TA51 thumb screw mount of the RCOs. Both the TA75 and TA51 mounts can be reversed to put the levers or screws on either side of the scope and rifle. 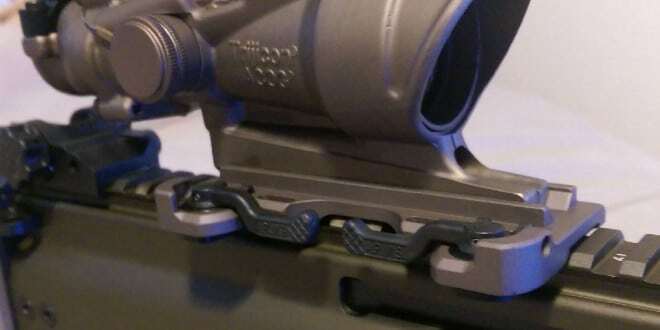 They can also be removed, and the ACOG slid into the AR15 carry handle as well as a few other mounting solutions. Funny enough our SDOs (Squad Day Optics, ACOGs for our machine guns and the new M27 IAR) in the Marine Corps use all the little ergonomic improvements the ECOS has over the RCO. Being that most of the M16A4’s and M4’s have RCO’s, that is a LOT of parts to update for a creature comfort (we aren’t big on those). 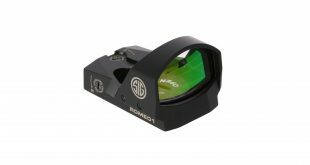 Aiming solution number two on the ECOS is the RM01 Ruggedized Miniature Reflex Sight. The RMR’s, like the ACOGs, have many versions with different reticle styles, colors, and illumination optics (both LED and dual fiber optic/tritium). The RM01 on the ECOS uses an auto regulating LED with a 3.5 MOA dot (3.5” at 100 meter/yards coverage of the target). The only controls are windage and elevation adjustments. No on/off switch. The circuit on the optic is always on as long as the battery CR2032 is installed. It uses ambient light to adjust the LED for brightness based on the environment. It does have noticeable “settings” and the brightness at times can seem a bit too bright or dim for conditions, especially indoors, but it does a good job and is consistently visible, just not “perfectly” bright. The dual illuminated versions would be better fits in my opinion, that aside I love using this to shoot close in (0-50 meters) it’s fast and accurate. 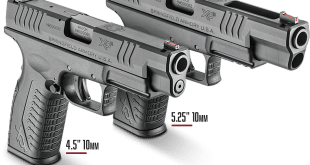 For any whom care for this academic fact, the RMR is not a true zero parallax red dot, meaning there is some minor point of aim distortion based on your eye position behind the optic. This goes away after 50 meters distance and for anyone who wants to do the math it equates to less than an inch of distortion inside 50 meters, or the edges of the dot basically. You will experience more inconsistency in point of aim/point of impact from your sight over muzzle distance than you will from the minor parallax as the RMR is about 3” above the barrel. Since the sight never turns off it is always eating the battery, but the efficient LED technology gives the RM01 a one year active and 3 year passive (total darkness AKA cased/in a safe) battery life. There is no low battery indication, just a fading reticle. Check it every six months and have a fresh CR2032 in your kit, replace at 18 months and no issue should exist. Since most optics have battery life in the hundreds or maybe thousands of hours I’m not going to scoff at 15,000 just because it isn’t the longest on the market. The battery is reached by removing the RMR from its base on the ACOG. Recheck zero when possible after doing this, I experienced no drift but the possibility is there. The final aiming solution is more of an “if all else fails” measure. An offset and wide aperture set of iron sights with a 5 inch front to rear span. These will get your rounds heading in the correct general direction but are nothing to expect accuracy from. They can be used more passively as a reconnaissance aid, line up the irons on an object in question to instantly find it in the 4x scope. The range and practicality of these are incredibly limited but Trijicon came up with a functional solution to the possible and often voiced concern of not having a good back up to a mounted ACOG (rear sights being hard to keep on and keep good eye relief at times). So what did I test this optic on? Yes this M855 5.56x45mm calibrated optic for 14.5” barrels went on top of the 7.62x51mm rifle with a 16” barrel. Why? The matching color scheme got me. 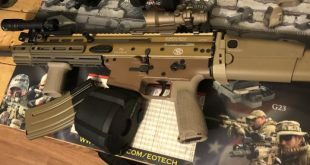 It now sits on an FDE AR15 but on top of the SCAR17s the ECOS was right at home. A quick check of my longer range holds via ballistic calculator, and I knew what the aiming points represented with this rifle within a decent margin of error. The ECOS was a great solution for the SCAR17s, I tested extensively as a CQB type optic and it ran in my hands with the familiarity of my old M16, just a much bigger boom (and smile) when I pulled the trigger. One of the first things I noted when running it on the SCAR17s is the ECOS is most at home, by far, on an AR15. First point of friction is the charging handle of the SCAR running close to the top rail, when grabbing and wracking it quickly you will impact the levers or knobs of any ACOG or mounted sight with your knuckles. After doing this a couple times, I tried moving the charging handle over to the opposite side of the rifle. I didn’t like that solution so I unscrewed and reversed the TA75 mount instead and found it to be the fix I needed. The second thing is eye relief, with ACOGs your eye sits about an inch and a half from the ocular lens. The SCAR17s is a .308/7.62x51mm and, despite well-tamed recoil, still fires that full power cartridge. If I didn’t properly extend the stock to fit my frame I could (and did once) “scope” myself in the eye. Oh, that little rear iron sight aperture is great at splitting your forehead when it hits you too. After that one and only head wound, I adjusted the stock’s length of pull to fit my frame and had no more issues of sudden recoil induced cranial contact. The ECOS is most assuredly my favorite optic in inventory. My history with the ACOG might add a level of bias but I also can’t deny the facts of a truly combat proven optical solution. The ACOG is designed from the ground up to be as hands off as possible, once it is set up and zeroed. The ECOS is point, shoot, and repeat type of simple. Now the kicker, the ECOS retail value is $2,174.00 with a quick scour of the internet yielding a sale price of just over $1,847.00. It isn’t cheap glass, but its combat grade like little else on the market and backed for life by Trijicon. The ACOG remains my favorite multirole solution for modern tactical rifle optics. It’s a “Jack of all Trades, Master of None” that has successfully minimized the amount of manipulation necessary and reduced the guess work of high speed combat style shooting more than anything else I’ve tested. I connect time after time after time, and that’s exactly what I demand of any optic serving in that role. The ECOS is worth every penny.